NEAR the little village of Ballycarry, on the Antrim coast, are situated the ruins of Templecoran Church. This spot has been rendered memorable by several interesting particulars. Here, in the year 1611, the first Presbyterian congregation in Ireland was established; in the adjoining cemetery is the grave of the Rev. Edward Brice, its first minister. 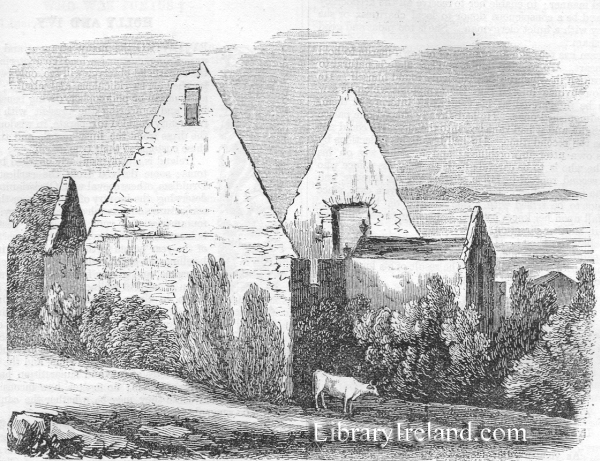 The living of Kilroot, in which parish the ruins are situated, was the first to which the celebrated Dean Swift was appointed, but which he is said to have resigned from a natural aversion to retirement or solitude, for his life at Kilroot, so different from that which he had led with Sir William Temple, where he shared the society of all that were ennobled, either by genius or birth, soon became insipid. Temple, who had learned, by the loss of Swift, his real value, became solicitous that he should return to Moorpark. While Swift hesitated between relinquishing the mode of life which he had chosen, and returning to that which he had relinquished, his resolution appears to have been determined by a circumstance highly characteristic of his exalted benevolence. In an excursion from his habitation, he met a clergyman, with whom he formed an acquaintance, which proved him to be learned, modest, well-principled, the father of eight children, and a curate "passing rich on forty pounds a year." Without explaining his purpose, Swift borrowed this gentleman's black mare, having no horse of his own, rode to Dublin, resigned the prebendary of Kilroot, and obtained a grant of it for his new friend, whose joy assumed so touching an expression of surprise and gratitude, that Swift, himself deeply affected, declared he tad never experienced so much pleasure as at that moment.